This is a great packet for Kindergarten students review math and language arts material independently with a February, winter theme. This pack is 100% in Spanish and geared toward Spanish Dual Language / Immersion elementary-aged classes. •	Complete simple number patterns by 1s or 10s. 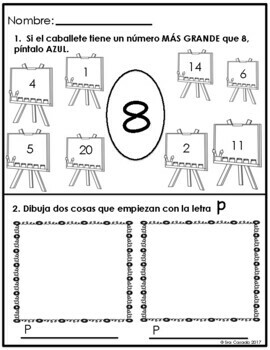 •	Identify and draw 2-D shapes. Determine how many sides a given shape has. •	Draw a simple picture using shapes. •	Compare 2 groups of objects and determine which one has more, less, or equal. •	Add and subtract within 10. •	Match two numbers that will add up to 10. Great for Morning Work or Homework! 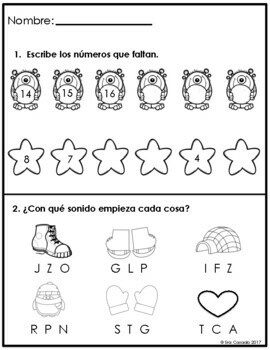 This resource was designed and copyrighted by © Sra Casado 2015. All rights are reserved. With the purchase of this resource you have permission to print and copy it for single classroom use only. Electronic sharing and distribution is prohibited. Additional licenses can be purchased as needed at a discounted price. Please do not hesitate to send me a message at jencasado@gmail.com if you have any questions about the product. • Follow me on Instagram (@sra_casado) and my blog Sracasadoteachesbilinguals.blogspot.com for tips, freebies, and to see my products in action! • Click on the green star next to my store logo. Yay! You will now receive email updates about Sra Casado! • Log in and go to your “My Purchases” page. Click on the “Provide Feedback” button next to your purchase. You will be taken to a page where you can give a quick rating and leave a short comment for the product. Yay! Now you have credit from TpT and I am able to learn more about what products work for you!